← Apple services under attack? Great find. Nice to see NVMe support in OS X.
It’s too bad the OEM-only Samsung SM951 doesn’t have NVMe support. Don’t know why Samsung changed their plans on that. It would have really made a difference in small file transfer speeds. Many thanks for these investigations! Well, you mentioned the entry for System Profiler for NVMExpress devices for an Early 2015 (r)MacBook Pro (13-inch). Does this “doesn’t contain any NVMExpress devices” show up on the Early 2015 MacBookAir13, too? If so, then while getting a MacBookAir7,2(13″,early2015) right now it may be wise to go with the 128GB variant only and wait for M.2 SSDs with NVMe comming this year. What about the Intel 750 ssd? will it be possible to have it work with Yosemite? I have the Intel 750 400 GB. I bought it for my Linux PC, and it’s working fine in that machine. But out of curiosity I put it in my MacPro 3,1 (early 2008). 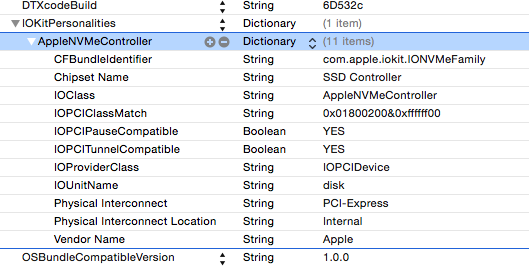 The system profiler shows the “This computer doesn’t contain any NVMExpress devices” message, and kextstat shows that the com.apple.iokit.IONVMeFamily driver has not been loaded. The System Profiler does show the adapter though (see below). I manually loaded the driver using kextload, but this (unsurprisingly) did not make the drive available. System Profile also still reported “Driver Installed: No”. So it looks like getting the 750 to work on a MacPro will require a bit of tinkering. It might be that the Apple’s driver specifically looks for the vendor and device ID of the NVMe drive in the new MacBook. Note that as far as I know, all MacPro models have PCIe 2.0 slots at best, while the 750 is a 4 lane PCIe 3.0 device, so even if you get it to work it would be suboptimal. In my machine it’s even reported as using PCIe 1 link speed. Just to let you know, the new Macbook, Macbook Pro and Macbook Air all indeed are NVMe, in fact the Samsung SM951 is also NVMe. All show under NVMExpress. Anyone know how to get PCI-e NVMe devices working? (like an Intel 750 Series, or P3600? Piker, i bought a Intel SSD 750 and am living near antarctica so i can neither travel or easily give it back. Any chance to get it to run in a mackintosh with an x79 mainboard? Thank you! Anyone get the Intel 750 400gb card to work? I can install windows just fine on an older Z68 board and boot from it thanks to a modified clover nvme-express driver i modified as an ffs bios module, but using Clover to boot an el capitan partition on the 750 suddenly stops loading half way through. I think its because the vendor ids not matching some plist file on some kext. Wonder what Pikers thoughts are on this? First. Just to make sure that we are talking about one and the same driver; Is that the compiled/converted Intel UEFI Driver that you have added to your Z68 BIOS? Now. Are you trying to use the Apple IONVMeFamily.kext or the kext that Jim released? Note that Jim already confirmed that power management is not supported by his driver, but I also would also like to find out if S.M.A.R.T is supported or not, because on at least one screenshots that I have seen it did not support it. Which is pretty important for people with a Samsung 950 Pro and/or 951 NVMe. One other thing. Using (M2) SSD’s makes thing fly and boot fast, but please don’t forget to make backups, otherwise you may regret it that you did not – there is no way of recovering data from flash drives once it is broken. I converted the nvme express driver that came with the Clover installer package into my bios using edk2 genffs tools. That allows me to boot from the drive. I also tried adding the macvidcards nvme driver kext into the clover efi kext folder. That allows me to see the nvme drives from another installation. I’ve got two three clones of my El Capitan install plus an emergency USB key if anything goes wrong. Problem is the clone partition on the nvme Intel 750 drive just stops loading half way through right about after the pxhcd kext is done loading. On my other system I can tell that next comes mounting the drives which must be the problem. Thanks. Ok so you are indeed using Jim’s driver. Which is cool, but I never used his driver and I am also not going to use it. Next to that. I don’t even own an Intel 750 SSD so I don’t think that it would be fair of me to comment on it. Isn’t there anyone else that can help you? I am using the kext Jim, it’s working just fine on Yosemite, but on el capitain, no good, Jim seems to have left the development, Pike why would you not use it ?? Now you know. I only want to use Open Source Software so that I can change/improve stuff when required. Now we cannot. but there are hopes for the future? So I downloaded the shell script from GitHub to create a Hackerblahblah.kext. I recursively changed the owner to root and group to wheel and copied the driver to S/L/E. Rebooted the machine: but the 950 Pro does not show up. I do not use Clover as I don’t care about starting up from the 950 Pro. I only want to use it as a recording drive for my audio production work station. Clearly I am doing something wrong. Can you perhaps shed some light on my stupidity dear @pikeralpha? THanks man. Run kextutil [kextname.kext] and check the output/log for errors. I got it to work. I forgot to disable SIP. (I have 2 disks: 1 SSD and one other where I always experiment on before applying stuff to the real system disk so I booted from SSD and copied the Hacker.kext to /S/L/E without disabling SIP).